Really, does the world need another garden blog???? I’ve resisted the pull for some time–to add my voice to the throngs of garden blogs. Alas, I’ve given in to the…green side. I don’t really know if I have anything new or different to add to either the blogosphere or to gardening in general, but I thought I’d give it a whorl (pun intended). I’m hoping to do what others do–lament the awful heat and drought gripping Texas, post groovy pics about home projects, profile my favorite (or not) plants and discuss the whys and hows of transforming a boring grass home landscape to something vastly more interesting to wildlife and humans. With a nod to the excellent and informative gardening blogs that I’ve enjoyed for several years, here goes. I’ve been familiar with Lindheimer’s Senna (Senna lindheimeriana) for years, although only planted some in my personal garden about a year ago. These have grown quite tall (really, a little too tall for the spot they’re in, but I like them and they were great all summer). I love the soft (a common name for this plant is Puppy dog ears), grey-green foliage and the little flowers are bright and cheery. Mine are planted in a difficult spot. The area is bordered by the driveway and street, gets dappled shade most of the day, but receives the hot, blast of the Texas sun after about 3PM. They’re doing a bit of a lean-thing, but I’m still happy with their performance. 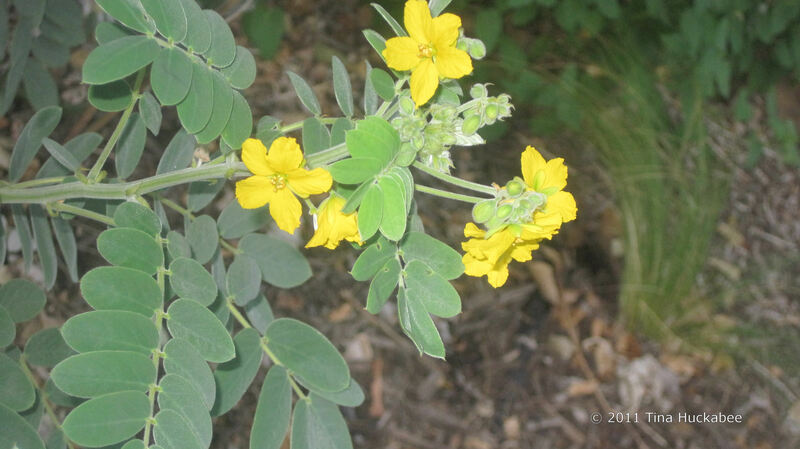 I grew to admire the Lindheimer’s Senna in my job as gardener in the Green Garden at Zilker Botanical Garden and noticed that they seed out regularly, although not so profusely that they become weedy. A sweet volunteer who was a Habitat Steward gave some seedlings to me to plant in the part of the garden that is certified as a Wildlife Habitat. Some of her seedlings didn’t make it through our freezes in January/February 2011, but two did and they are lovely now. (No photos of those, you’ll have to visit the gardens!) I have noticed that they are a bit tricky to transplant as seedlings, though. I plan to add more of these great plants soon, both to my personal garden and to the Zilker gardens. Check out the information on these native Texas plants on the NPIN website. 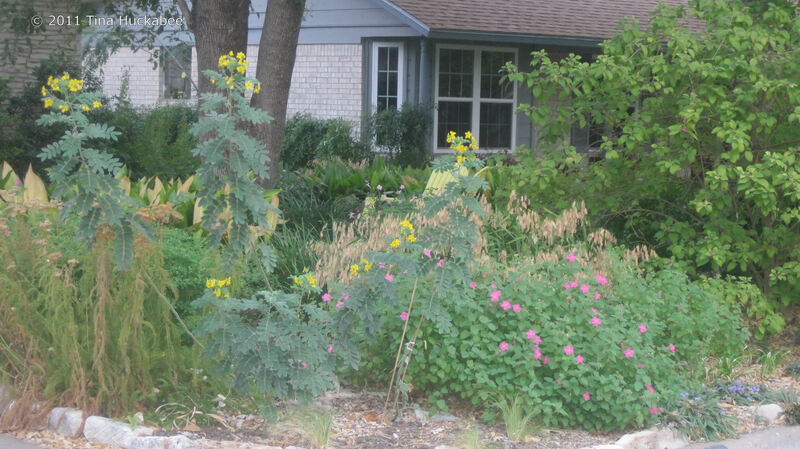 This entry was posted in Lindheimer's senna, Native Plants by Tina. Bookmark the permalink. Welcome to the blogosphere, Tina. Yes, the world definitely needs another gardening blog. Every voice is unique, and you have great experience to share. Blog on! Thanks Pam, for your encouragement and sound advice! Of course we need another garden blogger. Hope you will join us at the Go Gos. I also love the senna. It just re seeds in my gravel and I love it at this time of the year. It is a little lanky even in full sun but nothing eats it and nothing kills it- so that’s a bonus. Welcome to bloggerland. Thanks, Jenny for the welcome! I was looking at my senna this morning and debating the removal of the infant seed pods to encourage more blooms, while I watched the bees enjoy their breakfast. It is a beautiful plant. Have you noticed many pollinators visiting your Lindheimer Senna? I’m seriously debating its inclusion in my garden, so I’m curious what insight you have. Also, have you tried growing it from seed? If so, was it difficult? Mostly I saw honeybees, although there were a few skippers flitting around the blooms. I like this plant–it has a rangy growth habit, but in the right spot, it adds some drama. The soft gray leaves pair nicely with the bright yellow flowers. I haven’t grown it by seed, although I’ve transplanted seedlings. They transplant well if you prune back most of the leaves and baby them a bit. I hope you plant senna. I don’t think you’ll regret it.